A fighter that was born with nitro glycerine in his hands and extraordinary talents, Billy “The Kid” Dib has gone on to capture the attention and imagination of the boxing world. 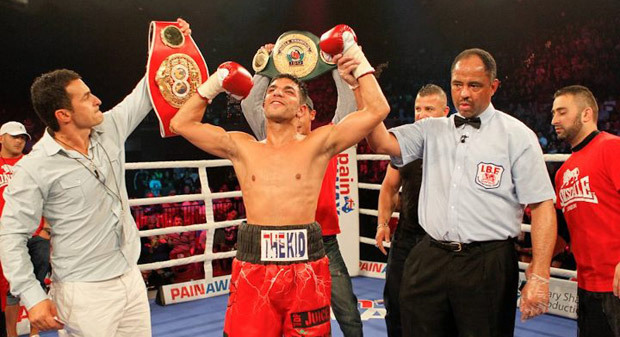 Still yet to reach his full potential though, Billy Dib is one to watch out for as he looks to conquer the world. Born on the 17th of August, 1985 in Sydney, Australia, Billy took up boxing at the age of 12 in order to rid himself of his asthmatic condition. He also found that it was a useful way of learning how to defend himself after being bullied for so long in primary school. Once Billy found his way to the local PCYC courtesy of his older brothers, he caught the attention of a trainer who told Billy that he had the skills to become something special.Billy stuck to it and began boxing competitively in the amateur ranks. He soon began appearing in amateur competitions, going on to win 98 of 113 fights. During this period he was Australian Champion on three occasions and gained selection to train at the Australian Institute of Sport (AIS). However, Billy’s preparation for the 2004 Olympic Games was hindered by a motorcycle accident and missed selection for the Australian team. After turning down an offer to join Lebanon’s Olympic team, the country of his heritage, Billy found his way to Sheffield to train with Prince Naseem Hamed after sending out video tapes of his amateur fights. Hamed subsequently offered for Billy to join him in Sheffield to train and there he would convince Billy that his style was better suited to the professional ranks. Billy, on the advice of Hamed, turned pro in August, 2004, defeating Chad Roy Naidu in the 4th round. He would go on to win his next 12 fights before travelling to the United States to train with Mike Tyson. While there, he met Sugar Shane Mosley and was consequently signed to Oscar de la Hoya’s Golden Boy Promotions. Billy went on to rack up 7 wins, 5 in America, before fighting Zolani Morali for the International Boxing Organisation (IBO) Super Featherweight World Championship on the 8th of July, 2008. He won by unanimous decision, capturing his first world title. In his next fight, Billy would suffer his first loss at the hands of Steven Luevano by unanimous decision while challenging for the World Boxing Organisation (WBO) Featherweight World Championship. Billy said at the time that he was unbowed by the defeat and promised that he would soon be world champion again. He has since contested 11 fights, winning 10 with 1 No Contest, 8 of them coming by way of Knockout. His last 7 fights have all ended by knockout. This string of wins has helped him gain the number 4 spot in the International Boxing Federation (IBF) Featherweight rankings as he continues to push for an opportunity to face one of the Featherweight world champions.